My boys have liked playing with slime for years. It’s really easy to make your own from just a few simple household ingredients. 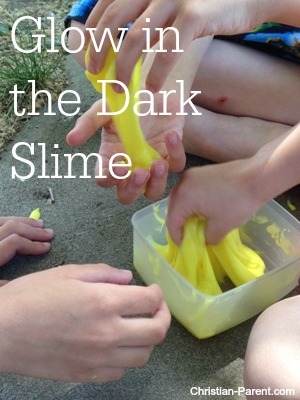 I recently saw an idea for a new twist on the recipe–glow in the dark slime! How fun! It’s really simple to make your slime glow in the dark. All you need is a small bottle of glow in the dark paint that you can find in the craft section of Walmart. *You can find borax in the laundry section at the grocery store. It comes in powder form. In a bowl, mix together glue and 1/2 c. water. Stir in glow in the dark paint and the food coloring. The food coloring is optional, but it will give the slime a brighter color. In another bowl, mix together borax and 1 c. warm water. Slowly pour the glue mixture into the borax solution, and stir to combine. As the mixture starts to thicken, let your kids use their hands to knead the slime until it becomes thick and easily handled. Store the slime in a ziploc bag. It will last longer if stored in the refrigerator. Copyright 2015, Christian-Parent.com. This article may not be reprinted.